The final 2018 numbers are in… 92 properties in 19 states / 41 cities, totaling more than 26 million square feet inspected. 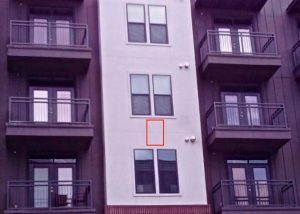 We gained several new clients using our thermography skills to identify building facade deficiencies that resulted in significant savings on potential multifamily apartment deals. A few were often on the “other side” of our due diligence findings. Ironically, this has always been our best method for new client acquisition. Due diligence is a comprehensive appraisal of a property undertaken by a prospective buyer to establish its assets and liabilities and then evaluate its income potential. There are many steps in the due diligence process, our expertise is on the PCA (property condition assessment) side, primarily performing non-disruptive façade evaluations. During a PCA, every facet of the property is inspected from the roof to the foundation and everything in-between. The primary benefit of a property condition assessment is that it gives the prospective buyer a thorough understanding of the property condition and allows the buyer to make informed decisions during a potential acquisition. This is arguably the most crucial part of the due diligence process. With such a significant potential investment on the line, due diligence is not where you want to cut corners. Having a qualified team on the project is as important as the process itself. Using specialized teams for certain aspects of the assessment can be essential for their particular knowledge in that discipline. They can discern issues that others may overlook and have up to date information including new techniques and new technology being used in that field. Usually, these are third-party consultants, and they can provide a unique insight into the PCA process. Infrared thermography is one of those specialized fields. 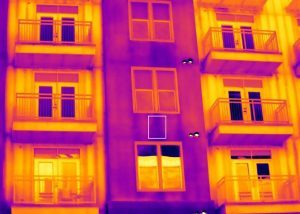 Infrared thermography is a unique approach to exterior facade building inspections, combining extraordinary technology with the knowledge of building science, this puts building thermography in a class of its own. 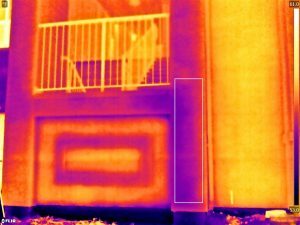 Infrared thermography is a technique for accurately measuring the surface temperatures of an object; it can be used to measure the surface of exterior walls, interior walls, ceiling, roofs, and around windows. Areas of inconsistent temperatures are commonly referred to as anomalies. These anomalies are captured as radiometric jpegs and are processed using specialty software. This allows us to evaluate a suspect anomaly further and determine if it requires further investigation. This process will enable us to non-destructively detect energy deficiencies like insufficient insulation and gaps for air to escape but more importantly, we can detect water intrusion and it’s impact on building materials. When water finds it’s way into a building, whether through a roof onto a ceiling, flashing failures, or behind outside finishes, it begins to evaporate and will start to cool and make that area colder than the surrounding area. This is the basic principle of why thermography works. 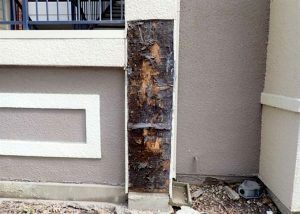 Detecting water intrusion of any kind is vital because unaddressed water intrusion issues can lead to extensive structural damage resulting in costly repairs. Quite often, before a property goes to market, it often undergoes a cosmetic “spruce up” by applying a fresh coat of paint. This makes the property more appealing and will often hide areas of potential concern. It is not uncommon for us to find significant issues that had been overlooked because it had not presented itself with visible observations. This is why thermography is so useful as a non-destructive “detection tool” during due diligence. Even after a property that is freshly painted, historical areas of water intrusions are often detectable because the thermal properties (ability to maintain consistent temperature) of an object with historical moisture will change. Different site conditions related to solar loading (sun exposure), extreme temperature conditions, wind, recent rainfall, and interior conditions can help or hinder thermography findings. Time constraints related to the due diligence process itself can sometimes make site conditions difficult. An experienced thermographer can overcome difficult site conditions. 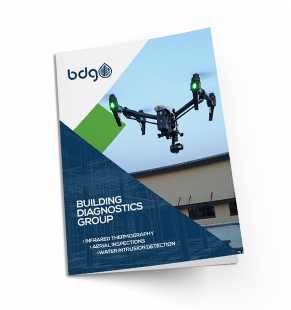 Knowledge of building materials, building components, and building assemblies can help interpret what is being detected by the infrared camera. Not all infrared cameras are equal. BDG uses only high-resolution equipment. Click HERE for more information on the differences of camera resolution.